Most of us learn about the importance of having and keeping regular backups only after loosing some of our important files, photos and documents. Luckily, I haven’t lost a single file and mostly because I have been lucky. Even the best hard drives crash and laptops get smashed or stolen. My first real backup solution more than six years ago was a 120 GB external hard disk that needed a bulky power adopter to be plugged into the wall and turned on before it could be used. There was no software that would be able to sync only the modified files so I had to create folders such as jun_2006 and aug_2007 and copy everything again and again every time. USB transfer speeds were slow and it took only month to have reached the ultimate backup mess on that external disk. 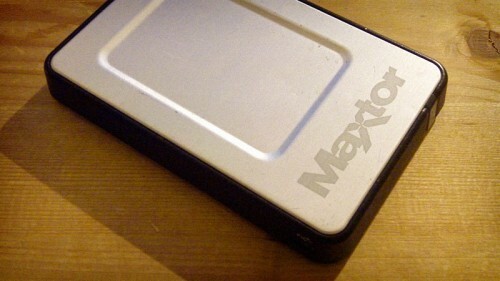 Few years later I got a new external Maxtor disk that would use two USB wires to power the disk instead of the external adapter. It should have made it easier but it didn’t because the syncing software was still too slow and hard to configure to do any good. So I lived my life on the digital edge and presumably didn’t think about loosing all my client website source files, server access information, invoices and many other important files. The fact is that I don’t buy software before I make sure that there is no way I can build it myself or find an existing open source solutions. I was surprised to discover that I couldn’t buy even the necessary disk space on any shared server for the price of most online backup solutions that were available on the market. The conclusion was simple — I had to choose from the existing online backup providers. complex software that slowed down computer. None of these limitations are relevant today — bandwidth and storage are cheap and performant software is a must (just look at Apple and Google Chrome). Nobody should think about which photos or documents to backup just to avoid having unexpected payments at the end of month. I don’t remember how I discovered Backblaze, but their offer sounded exactly how I imagined it should be — reasonably priced and without limits. It automatically created a trial account for me once I had it installed and I didn’t even have to visit their website again. In a few days I had forgotten that it was running in the background and all my important files (~ 40 GB) were backed up just before the end of the 15-day trial. I was amazed at how fast and resource aware their software was both on my Mac and Windows machines and what a difference it made. After being their customer for two month I signed up my girlfriend’s laptop under the same account and today we both have around 150GB stored at Backblaze servers for $10/month in total. Recently I got a new Macbook Pro as my main machine for work and I ended up using Backblaze to transfer all my documents and files from the old Windows machine just because they were already in the Backblaze cloud. Restoring files using their website is really simple — just select the folders you want and a single .zip files is prepared for direct download in minutes. I have a 100 Mbps internet connection at home, so it ended up being faster than if I had used an external hard drive. A month ago I went to Germany for a little weekend vacation and didn’t bring the laptop with me because I had just finished all the work and I really didn’t want to think about it for at least a weekend. On Saturday my colleague calls and asks for a little but important modification to one of the presentations that I had just finished. I had sent him a PDF version of that presentation due to some font issues so there was no way he could edit it. It took me at least five minutes to figure out that Backblaze might have managed to sync the latest version of the original PPT file that I saved on my desktop just before shutting down the computer. And it had! So I simply download the original presentation using the online restore feature and got it fixed in no time. It felt really good considering that my laptop at home was turned off and the wireless router was unplugged to save some electricity. There is no way I could have done it without Backblaze. Try Backblaze for 15 days and see if it works for you as well as it does for me. There is nothing like a comfort of knowing that all my important files, photos and podcast videos are stored securely in Backblaze datacenter and I can get them from wherever I am. Use Contact Form 7 to collect business leads and enquiries? I created Storage for Contact Form 7 plugin which stores them safely in WordPress database. Thanks, this is just the thing I was looking for! At the beginning I wanted to buy some Amazon server storage and a 3rd party software for manual upload/download for my photos and video files, but I couldn’t find a software simple enough for everyday use. 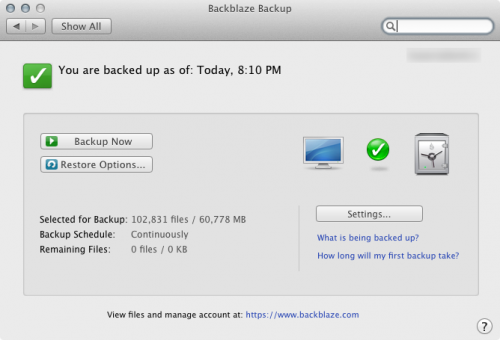 Backblaze seems like perfect solution, I will try out their service right now. But speaking about documents, I have stopped worrying about my work files long time ago because Dropbox meets all my needs and it is completely free. And the best part of Dropbox is that it can work on all my machines at the same time. It can be used to synchronize data between iOS devices, Mac’s, PC’s and Linux installations as well. I agree, Miks. I use Dropbox only for files and folders that need to be shared with others. That public URL feature and the thumbnail view is really handy. However, in Dropbox you still need to specify which folders to include in the backup just like with those other backup software options and it requires some form of management and thinking as long as you don’t pay $10 a month for their smallest plan. Backblaze takes care of all your files by default which is what makes it better than the rest in my opinion. Kaspars, when all your files are in one folder then there is no need to think or manage anything. As long as you know that all you need is to save your work in “Work” folder, then there is no other managing involved. The problem is that my Work folder is over 2GB and I don’t want to buy another backup plan from Dropbox. But I love Dropbox for what it does and some of its features are really unique and useful. Please let me know what you think of Backblaze once you have it set up and running. I’m curious to learn more about oen of the key points of the blog, one that I’ve seen repeated elsewhere in discussions about online backup. You highlight the fact that you think services like this should be “reasonably priced and without limits.” I’m stunned (still) to see so many people write this same thing. Why would any one expect a service to have no limits? There are very, very few services of any kind that operate this way, and most that do ultimately leave the unlimited plans because the are no sustainable. Yes – certainly it is normal and understandable to expect “reasonable” pricing. But expecting a service without limits (to last) just seems silly, especially one that has real on-going costs (even if those costs improve with scale and improve over time). Are there examples of any services with variable cost structures that have had long-term successful unlimited offerings? Matt, what I meant by “no limits” storage is actually “no limits” for 95% of users. I honestly think that most people who use online backup need less than 100GB of storage, so why make them predict if they’ll end up using 10, 50 or 200 GB? Backblaze is built with those 95% in mind. I would be interesting to see their storage per user distribution to understand if that’s the case. Anyone have experience with both Backblaze and Arq’s implementation of S3 storage? This looks really interesting, Kel! I’ll give it a try to see how easy it is to setup and how well it performs. First, thanks for the quick response. Second, I agree that most people need less than 100 GB and I further agree that it is a serious hurdle to adoption of services like these that many users don’t have a sense of what their needs really are. I think service providers here should do exactly what you suggest (provide a service that comfortably supports 95% of people), but I find it *super* frustrating when they market “unlimited” but then caveat with (but no external drives or no data that isn’t mirrored or no NAS or we’ll slow down your transfer if you exceed a certain limit). Unlimited is a marketing angle, not a business plan. It may be a very effective marketing angle. Lastly, I would be extremely interested in the storage distribution for companies that offer unlimited versus those that don’t. Does Carbonite (now public) make that info available? I’ve looked (not too hard) but haven’t found it. Let me know if you have any questions about Arq. Just email support@haystacksoftware.com or tweet @arqbackup. Stefan, to my comment above – any changes or feedback from Backblaze? Also – I really like how Arq sits in the background but have not pushed it past my initial trial as I was still trying to find out the availability of a family pack. I just use Dropbox for the utmost important files – and to sync them to other computers; my laptop’s 500GB internal for consumable files and media that I’ll eventually just delete after (movies after I watch them, temporarily downloaded files, etc. ); and an 500GB external for the backups of everything else. I think MediaFire has unlimited file space as well. I must remember to check them out again. Send me new blog posts via e-mail.